It's easy to lose track of our daily sodium intake: Salt is hiding everywhere. Here's how to reduce sodium in your diet (your blood pressure will thank you!). It's difficult to keep tabs on our daily salt intake—but well worth the effort. 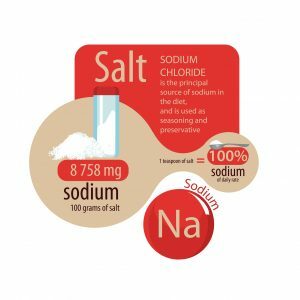 Reducing sodium intake lowers blood pressure, with greater effects among people with hypertension, according to the Centers for Disease Control and Prevention: "When salt intake is reduced, blood pressure begins falling within weeks on average." The good news: You don’t necessarily have to make huge changes to reduce your sodium intake. For instance, if your dinner plate is normally half full with meat and half full with a starch—both of which tend to be higher in sodium—try filling half the plate with a non-starchy vegetable (such as broccoli, cauliflower, asparagus, green beans, and peppers), a small amount of lean protein, and a small amount of a starch. Fruits and vegetables: Fill half your plate with an array of colors and types of whole fruits and vegetables. Grains: Fill a quarter of your plate with grains, with at least half of them whole grains, such as whole-wheat bread, brown rice, and whole-grain pasta. Protein: Protein-rich foods, such as beans, nuts and nut butters, skinless chicken, non-fried fish, lean meats, and eggs, should occupy the remaining quarter of your plate. Dairy: Include 3 cups of low-fat or fat-free dairy products a day, such as milk, yogurt, cheese, cottage cheese, and soy milk. 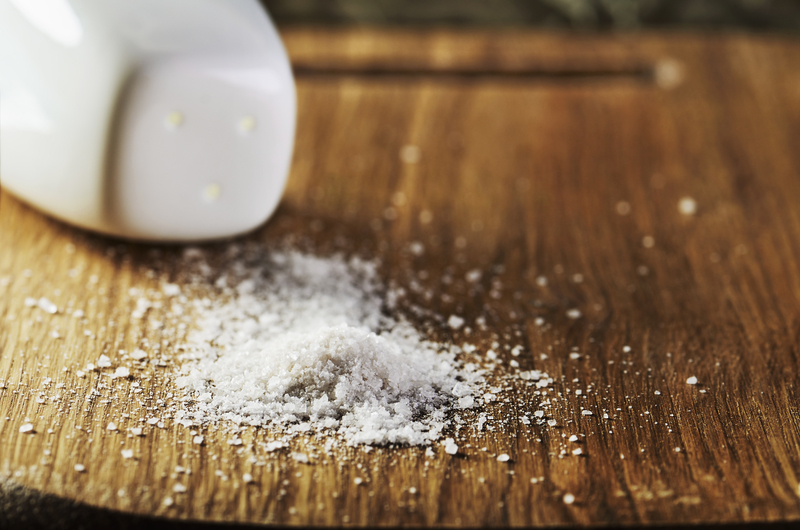 One obvious way to cut back on your sodium intake is to put away the salt shaker. Table salt, or sodium chloride, consists of about 40 percent sodium, with each teaspoon of salt containing 2,300 mg of sodium. Remove the salt shaker from your table, and don’t include salt in your cooking. Instead of salt, spice up your food with other seasonings, such as pepper, lemon juice, onions, or garlic (or onion or garlic powder, but not garlic salt) or herbs such as basil, thyme, or parsley. If you do use salt, try setting aside a ¼ teaspoon (575 mg of sodium) or a ½ teaspoon (1,150 mg of sodium) in an empty salt shaker so you can tell how much you’re allowed to use each day. And, be more selective in the foods you salt: Pick the foods you have to salt and reserve your salt allotment for them. The salt shaker isn’t the only source of sodium in your diet, nor is it the largest. More than three-quarters of the sodium in the American diet comes from processed or prepackaged foods along with restaurant food, according to CDC estimates. In fact, only 6 percent of dietary sodium is added at the dinner table and 5 percent is added during cooking; the rest occurs naturally in foods, the CDC notes. Breads and rolls: The sodium content in one slice of bread can range from 80 to 230 mg. Lunch meats: The tasty meats you get at your local deli are major sodium suppliers. Just six thin slices (the amount in one serving) contain upwards of 750 mg of sodium. Frozen pizza: Just one slice may contain anywhere from 370 to 730 mg of sodium. Canned soups: One cup, or 8 ounces, of canned soup may contain as little as 100 mg to well over 1,200 mg of sodium, which for many people is nearly their entire sodium allotment for a day. For instance, one cup of tomato soup may contain 700 to 1,260 mg of sodium, the CDC explains. And, keep in mind that a can of soup may hold two cups, so if you eat the entire can, that serving size—and the sodium content—doubles. Canned vegetables: Like their soup counterparts, canned vegetables can seem like a healthful choice, but they also tend to be higher in sodium compared with fresh or frozen varieties. For example, a whole fresh tomato contains 6 mg of sodium, whereas a can of no-salt-added tomatoes contains 20 mg per half-cup and a can of regular tomatoes contains 220 mg per half-cup, according to the CDC. (Note that jarred or pickled vegetables also can be high in sodium.) Before you eat canned vegetables, rinse them under warm water to help remove some of the added sodium. Chicken: Chicken and other meats may be packaged in high-sodium flavoring solutions that can drive up your sodium intake. Your daily sodium intake doesn’t come only from the foods you eat, but also from the additions you make to them to spice up their flavor. Prime examples: condiments and other toppings. For example, just a tablespoon of reduced-fat Italian dressing can add 134 mg of sodium to your normally healthful salad. Sprinkle a tablespoon of soy sauce on your rice and you’re bathing it in more than 800 mg of sodium. Plus, if you want to turn that hamburger into a cheeseburger with a 1-ounce slice of cheddar cheese, you’ll add 174 mg of sodium to the 100 mg of sodium already in the burger patty. Flavor the burger with a tablespoon of ketchup and you increase the sodium content by another 154 mg. So, it’s easy to see how you can exceed daily recommended amounts of sodium. Even so, you can start to limit the daily sodium intake you get from food by eating at home instead of dining out. It starts by making wise choices at the supermarket: Carefully review the Nutrition Facts label on all foods and beverages, and learn which products to choose and which ones to skip. When buying food products, check the label for the serving size and the number of servings contained within. If it amounts to two or three servings and you eat the entire package, you’re doubling or tripling the amount of sodium. So, find out how much sodium each product has per serving, and then multiply that amount by the number of servings per container. The FDA regulates the information required for each nutrition facts label, including the daily value, which represents the amount of nutrients recommended each day for people age 4 and older. In mandating changes to the nutrition facts label in 2016, the FDA reduced the daily value for sodium from 2,400 mg a day to 2,300 mg daily. A low-sodium product contains 5 percent or less of the DV of sodium per serving. 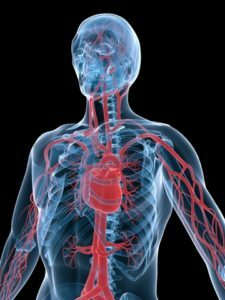 Sodium content equaling 20 percent of the DV or greater is high. What About Products with “Low-Sodium” Claims? Typically, frozen fruits and vegetables also are lower in sodium than canned varieties. Just avoid frozen fruit products with added sugar, as well as frozen vegetables with added butter, cheese, or other sauces that can drive up the sodium and calorie count. Light in sodium (lightly salted): At least 50 percent less sodium than the regular product. Reduced sodium: At least 25 percent less sodium than the regular product. Low sodium: 140 mg of sodium or less per serving. Very low sodium: 35 mg of sodium or less per serving. Salt/sodium-free: Less than 5 mg of sodium per serving. No-salt-added/unsalted: No salt is added during processing, but the product still may contain some sodium. Keep in mind that even foods labeled as “less sodium” or “reduced sodium” can still contain a lot of sodium, especially if the regular versions of a product are very high in sodium to begin with. For example, one tablespoon of “less sodium” soy sauce may contain 500 mg or more of sodium, the CDC notes. Overall, consider this one simple tip to help minimize your daily sodium intake: Spend more of your time shopping at the perimeter of the supermarket, and less time in the aisles. The perimeter is where fresh fruits, vegetables, and other healthful foods tend to reside, while the sodium-rich processed and packaged foods typically are kept on shelves in the grocery store aisles. burgeoning portion sizes at many restaurants and you can easily consume more sodium and calories than you’d like. So, to help keep track of your daily sodium intake, do some research before you eat out. Many chain restaurants include nutritional information about their foods on their websites, so look up the sodium content and choose a lower-sodium meal—keep the sodium to less than 600 to 800 mg per meal. U.S. Food and Drug Administration regulations now require all retail food outlets that are part of a chain of 20 or more locations to list the calorie content of standard items on menus and menu boards next to the name or price of the food or beverage. They also must provide written information about sodium along with saturated fat, sugars, and other nutritional content in menu items. It’s also a good idea to ask your server to have your meal prepared without added salt. Select restaurants that prepare items to your request or provide alternative entrées and side dishes that are low in sodium. “Daily Sodium Intake: Here’s How to Cut the Salt” is an excerpt from the University Health News special report Managing Your Blood Pressure. add, blood pressure, calories, cauliflower, cooking, dairy, diet, dietary guidelines, dietary guidelines for americans, fast food, food, garlic, health, health news, healthy eating, heart healthy, heart healthy eating, high sodium, milk, nutrients, nutrition, nutrition facts, nutrition facts label, nutritional information, nuts, portion sizes, protein, report, serving size, soy, soy milk, sugar, thyme, university health news, vegetables, whole grain, whole grain pasta, whole grains, whole wheat, whole wheat bread, yogurt. I must be careful I get enough sodium as I have experienced some serious occurrences of low blood sodium. I have also had to take 2 sodium-chloride tablets. .